The Dart was Slingsby’s follow on to the Skylark series of gliders which were very popular with British enthusiasts. It was the last of the great wooden gliders and was introduced, rather unfortunately, just as the glass fibre gliders appeared in Europe. These had a vastly superior performance. 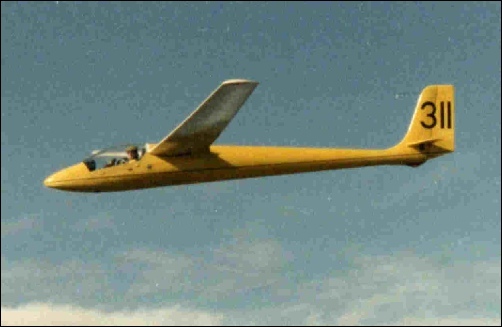 Made originally as a 15 metre Standard Class glider, it was a little disappointing and eventually was fitted with detachable wing tips to increase the span to 17 metres. This improved the glide angle and performance and a number of modifications then took place. Originally made with a NACA wing section, the final 17 metre aircraft were designed with a Wortmann wing section. The fixed undercarriage was replaced with retractable gear and a metal, all moving tailplane was fitted. A total of 81 Darts were produced and I believe that this was number 80, as it had all the modifications, including the wood/metal composite main spar. It’s official designation was T51 Dart 17 WR (17 metre, Wortmann section, retractable gear). The Dart had something of a bad reputation for “biting” inattentive pilots in that, from a slow, ‘dirty’ turn, it would spin and this resulted in one or two pilots being killed. I can confirm that if induced, 311 would spin quite sharply but recovered easily once the correct recovery procedure was initiated. The photograph was taken some 10,000 feet above Aboyne, Scotland, some time after I had left the syndicate.